Sites like this one just go into reminding us how many LEGO enthusiasts are out there. 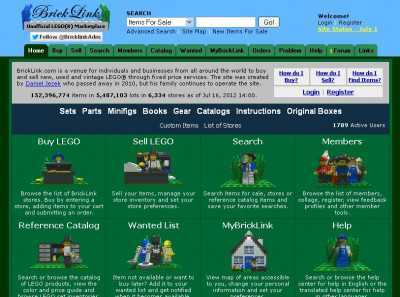 BrickLink.com is an online marketplace where nothing but LEGO sets and bricks are sold. The site is actually shaped like a big community, with users creating their own profiles and interacting with each other on many different forums and boards. 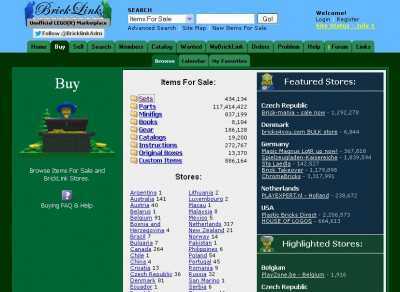 Products can be transacted on the “Buy” and “Sell” categories, and a section named “Wanted” is where requests for rare and hard-to-find items are placed. And the site also includes a list of specialized LEGO stores not only in the United States, but also in the world. You can browse it alphabetically, and check the stores that are available both where you live, and in nearby countries. And when it comes to searching for products, you can find them both by name and by catalog number. And you can check just every LEGO product that has ever been released on this part of the site. If (after searching for them) you find the items you’re looking for are not available anywhere, then you can save them to your wishlist. You’ll get notified when they’ve finally become available. And you can also stay on top of these products that are too expensive, and learn when their prices have gone down.